Última edición por A.P.M. fecha: 25-sep-2014 a las 18:48. Me gustaba el primero sin restyling, y me gustó después del mismo. Esta segunda generación me tiene prendido, así que esperemos que no lo fastidien. El primero tenia mas fallos que el windows Vista. May 2005 | 6.503 Mens. Oct 2003 | 26 Mens. Hay noticias de cuándo sale a la venta? 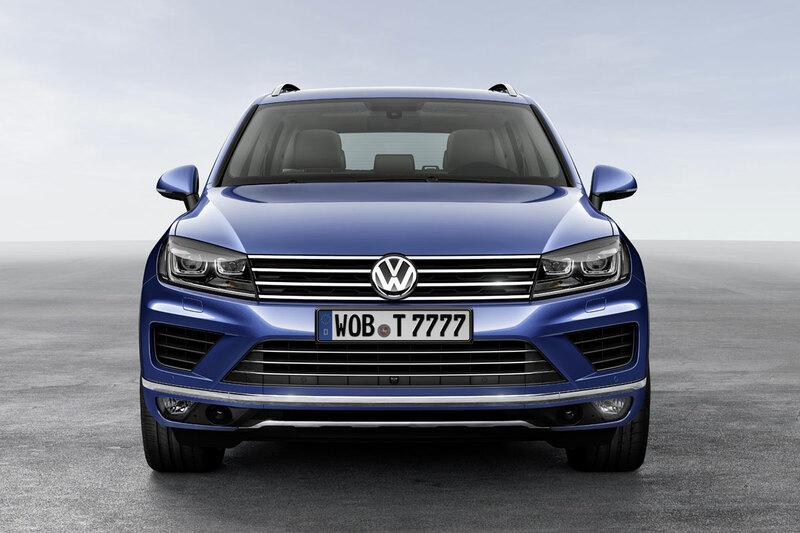 · New front and rear styling on the Touareg. · Bi-xenon headlights standard in all versions. 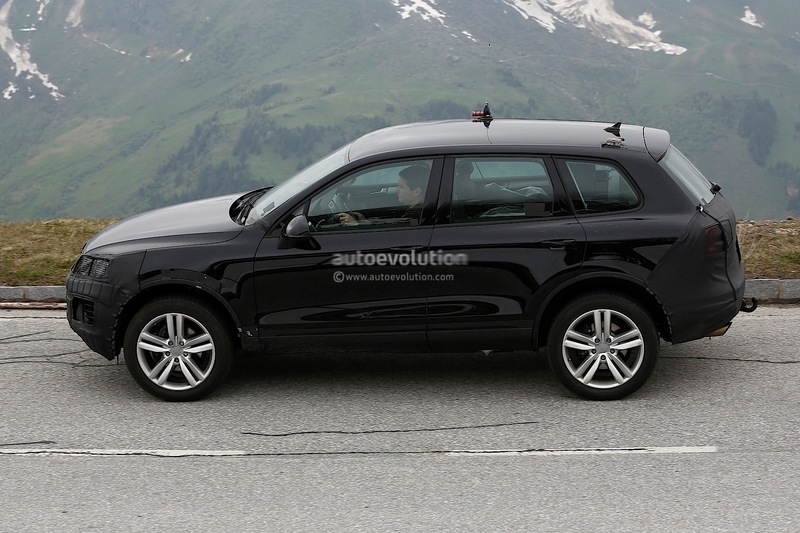 · Standard automatic post-collision braking system to avoid secondary collisions for all V6 TDI versions. · Interior features new leather colours, accents,buttons/controls and exclusive white illumination of controls. · V6 TDI (European version) fulfils EU6 emissions standard with newly developed SCR-DPF catalytic converter. · All Touareg models have coasting function as standard. · Mobile online services such as "Google Earth™ mapping service", "Google Street View™" and "Online traffic information" launch this autumn in Europe. · New colours and new wheels (up to 21 -inch). · New R-Line packages add dynamism to exterior and interior. · Market launch this summer. Wolfsburg / Beijing, April 2014. The Touareg is one of the world's most successful premium-class SUVs. Within one decade, Volkswagen sold around 720,000 units of the high-class sport utility vehicle; last year alone over 70,000 drivers chose a new Touareg, which combines the best of the passenger car and off-road worlds in one concept. Now, Volkswagen is presenting a world premiere of a further advanced version of the Touareg at Auto China in Beijing. The 2014 generation can be made out by the new front and rear designs and by its new colours and wheels. In terms of technology, all V6 TDI versions now come equipped with an automatic post-collision braking system (helps prevent a secondary collision in case of an accident), bi-xenon headlights and a coasting function. While coasting, the engine is decoupled from the 8-speed automatic gearbox to utilise the car's kinetic energy on mountain descents or in driving phases in which acceleration is not needed. Aerodynamic refinements and the introduction of new tyres optimied for low rolling resistance also improve fuel economy in everyday operation. 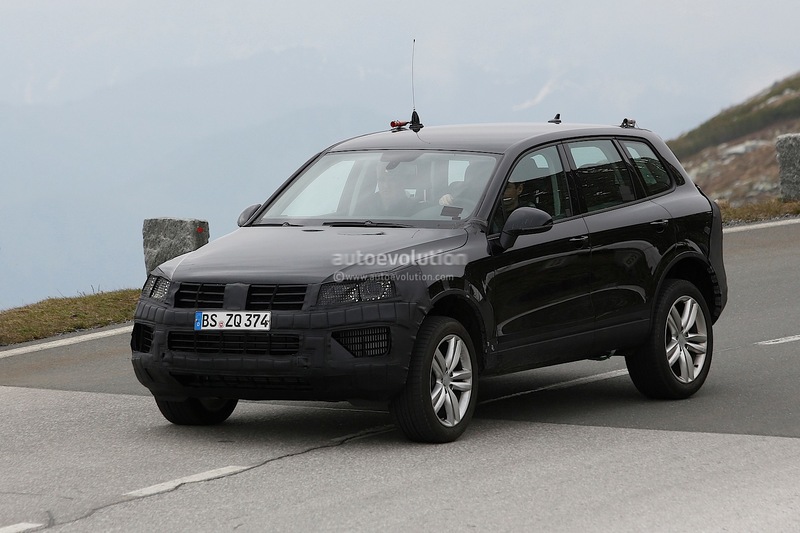 The V6 TDI engines of the Touareg were converted so that they fulfill the EU-6 emissions standard that takes effect in 2015 in Europe. Technical perfection. The standard steel-spring running gear was optimised; improvements include more agile steering response and a gain in comfort. An air suspension is available as an option for the Touareg; it can be used, for instance, to increase the vehicle's ground clearance by up to 300 mm in off-road driving. At higher speeds (from 140 km/h), the body is automatically lowered by the air suspension. Further developed was ACC adaptive cruise control with Front Assist including City Emergency Braking (now with stop -and- go function). Upgraded and networked. The interior of the versatile all-round vehicle is marked by new features, including new accents, leather colours, lighting solutions and controls. In conjunction with the RNS 850 radio-navigation system and mobile phone preparation, the Touareg will launch with "mobile online services" starting this autumn in Europe. In the initial phase, the following will be available: Points-of-Interest (POI) search via Google, map display via Google Earth™ mapping service, Google Street View™ functionality and "online traffic information". The latest version of the Touareg will launch on the market in diesel (TDI), petrol (FSI and TSI) and hybrid (TSI plus e-motor) models this summer. Front end. 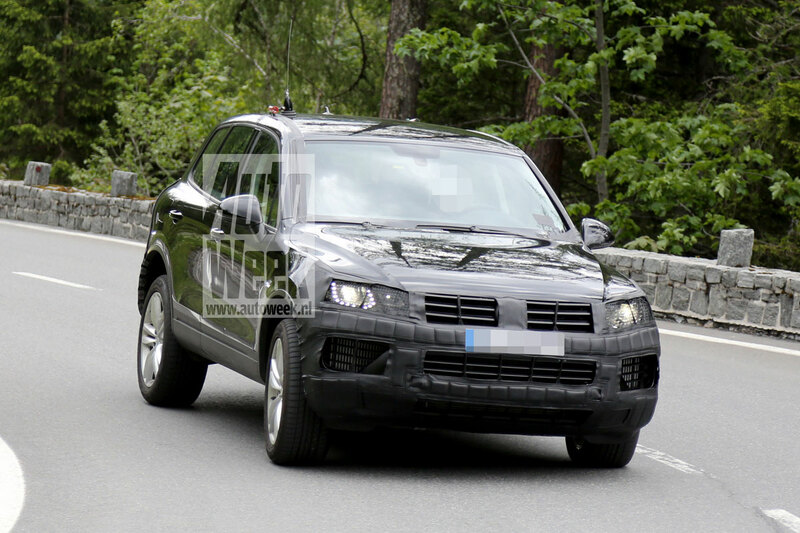 The front-end design of the Touareg was completely re-developed. Especially distinctive are the headlights which are now larger; moreover, bi-xenon headlights are now standard on all versions of the Touareg. The trapezoid-shaped lights create a line towards the re-designed radiator grille in the middle of the vehicle. In contrast to the previous model, the grille is trimmed with four transverse chrome fins instead of two ; the two lower fins are visually extended into the headlights. Together, the radiator grille and headlights form a prominent wide band. Designed as a parallel line beneath it is the new bumper, which is now styled for a more horizontal effect. 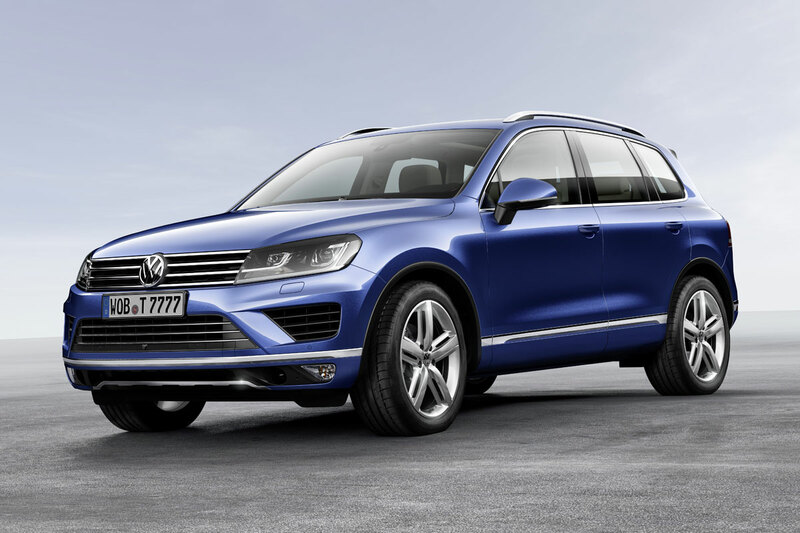 The new design gives the Touareg an even wider and more impressive appearance. Fitting into this visual image is the lower area of the bumper with its completely new look. As on the new Scirocco R, the 280-PS sports car from Volkswagen, the lower air inlet now forms a stylised "A" instead of a "V" that transitions into the side air inlets to the right and left. 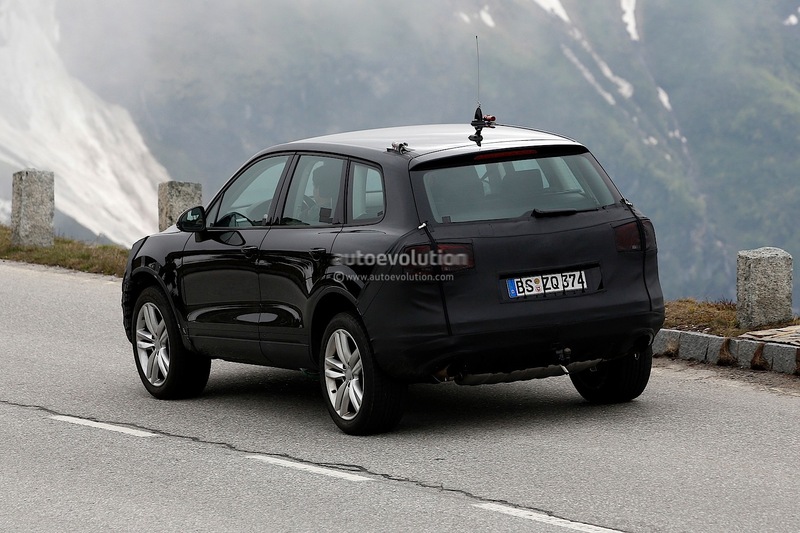 This gives the new Touareg a fuller stance on the road. When the "Chrome & Style" package is ordered, there is a chrome strip on the next level, which is continued into the side and rear body sections. Beneath this strip are the newly designed fog lights that are coord inated with the new bumper design. At the bottom level, there is a new front spoiler which perfects the aerodynamics of the underbody and the front wheels. Rear section. 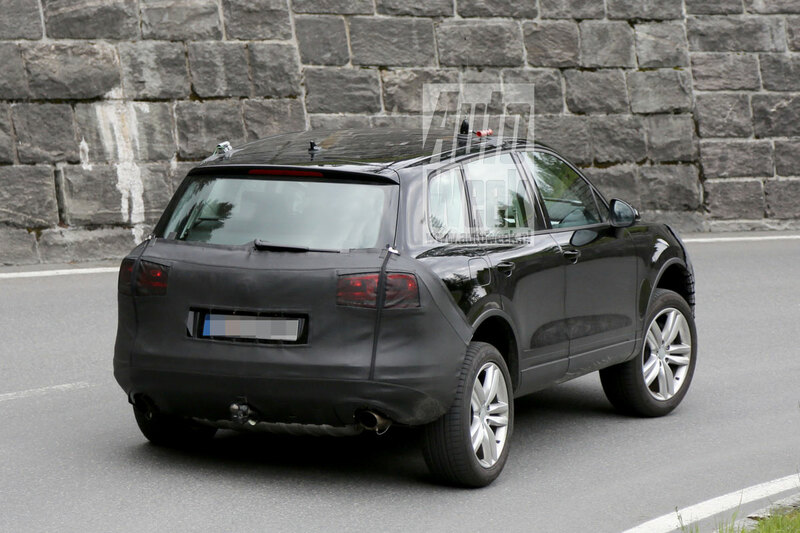 From the rear, the more precise styling of the Touareg is marked by its new, cleanly designed bumper, which – similar to the same area at the front end – emphasises the width of the SUV. When the "Chrome & Style" package is ordered, a wrap -around chrome strip is integrated in the bumper. Integrated between the exhaust tailpipes is a diffuser that has also been redesigned. 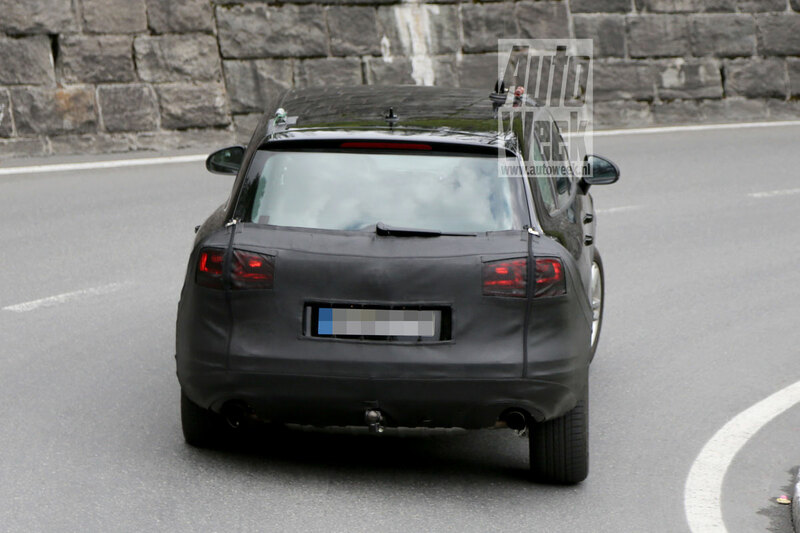 Designers have relocated the LED rear fog lights to the bumper, which – as in the previous model – also integrates the rear reflectors. 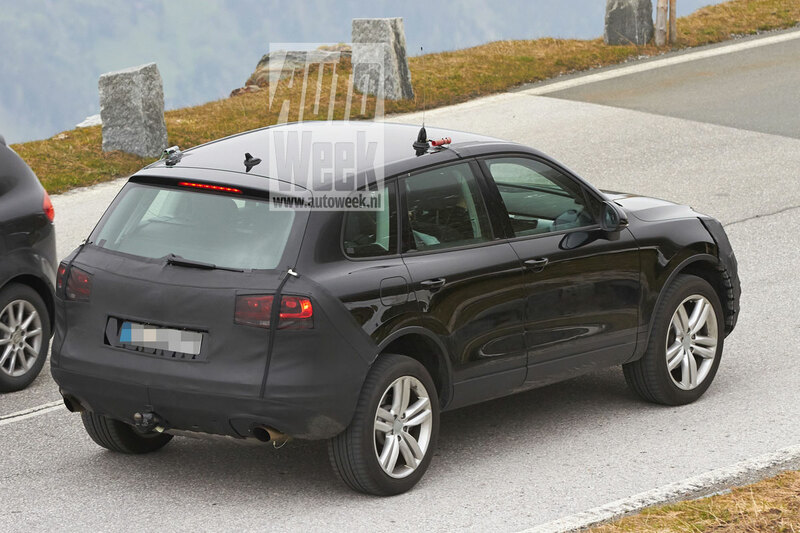 Visual highlights in the area of the boot lid, viewed from bottom to top, are the re-designed VW badge and a sharpened character line between the rear lights (LED optional). Side profile. 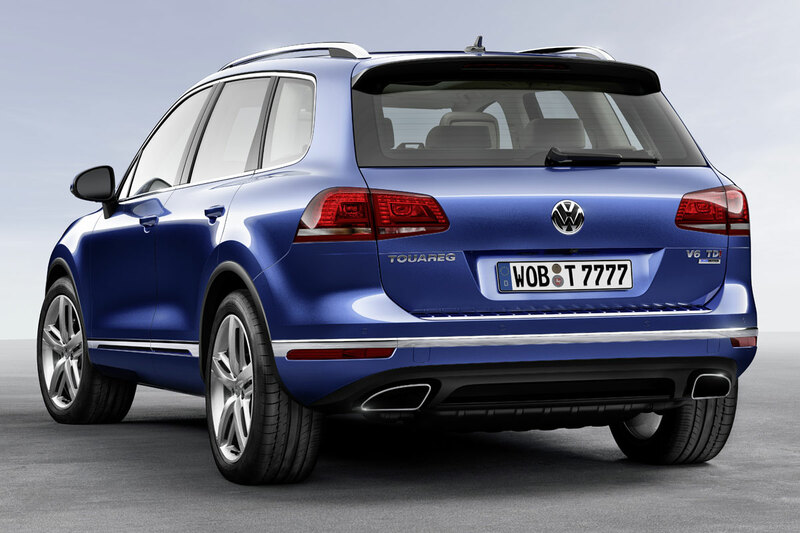 From the sides, the Touareg is distinguished by two new wheel designs. The 18-inch wheel of the new model generation is the "Arica" alloy wheel whose distinctive and sporty look includes ten spokes. The 20-inch "Masafi" alloy wheels, on the other hand, have five twin spokes. Supplementing the optional windows that absorb 65 per cent of the light, there is an option for 90 per cent light-absorbing rear glass which gives an almost opaque appearance to those looking in from the outside. Colours. Volkswagen is offering the latest Touareg in a total of twelve body colours; five of these colours are new to the programme: "Light Silver Metallic", "Sand Gold Metallic", "Moonlight Blue Metallic", "Black Oak Brown Metallic" and "Reef Blue Metallic". Controls. The interior of the Touareg reflects an extraordinary alliance of rugged SUV elements and sophisticated premium -class elements. SUV elements in the Touareg include the aluminium rotary knobs for the Climatronic system, running gear adjustment, air suspension, radio-navigation system, mirror adjustment and the air vent knobs – they have now all been replaced by a new style of rotary knob, which has been perfected both to look and to touch. Also conspicuous is the white – rather than red – illumination of all controls. Also new: chrome accents around the control panel modules and the running gear adjustment controls. Above the infotainment system, the central push button/display bar on the centre console was extended; previously, the three elements: "Park Distance Control" (PDC), hazard warning unit and status display "Passenger airbag off" were the controls here, from left to right. Now, a new switch for steering wheel heating has been added to the left of the PDC push button, and the new push button for windscreen heating has been integrated to the right of the passenger airbag indicator. New in the area of the front seats: a manual lumbar support adjustment for the entry-level Touareg model. Upholstery materials and accents. The line-up of upholstery materials and wood accents was also extended. Consider the "Vienna leather": a fourth colour, "Bonanza Brown" (dark brown), is now offered in addition to the colours "Titan black", "Corn Silk Beige" and "Natural Brown". Besides these four colours, there is also the very elegant "Nappa leather" which can now be ordered in the new colour "St. Tropez" (light sand hue). Also new: the two fine wood accents "Sapelli Mahagoni" and "Engineered Ebony". Extensive range of standard features. The V6 FSI and V6 TDI models come from the factory equipped with standard features such as bi-xenon headlights (new for all versions), all -wheel drive, 17- inch alloy wheels (size 235 tyres), cruise control system with multifunction steering wheel, RCD 550 infotainment system with touchscreen, stop-start system, regenerative braking, coasting function, climate control system (Climatronic), servo steering and ESC with trailer stabilisation function. The V8 versions and the Touareg Hybrid are distinguished by extra standard features such as 18-inch alloy wheels (size 255 tyres), the "Chrome & Style" design package, comfort seats in "Vienna leather", fine wood accents, electric opening and closing function for the boot lid, anti -theft warning system and the Keyless Access locking and engine starting system. Also factory-installed is a rear bench seat that offers 160 mm of longitudinal adjustment; the seat backrest angle can also be adjusted. The rear bench seat can be electrically unlatched as an option; this folds it down in seconds and frees up 1,642 litres of cargo capacity. Sporty R-Line. In late summer, Volkswagen will also be launching the very sporty R-Line features packages (exterior and interior). The R-Line exterior package upgrades the outside of the SUV and includes such features as 19-inch alloy wheels ("Salvador" design; other 19-, 20- and 21-inch wheels available as options), bumpers in R-Line design (front bumper in st yle of Touareg V8 versions), glossy black air inlets with additional chrome trim, side sill extensions, glossy black diffuser at rear (also with additional chrome trim), chrome tailpipes for the Touareg V8 versions and a rear spoiler that is as distinctive as it is sporty. In addition, an R -Line decal in the radiator grille screen signposts the car's dynamic features. The R-Line interior package adds the following to the Touareg: a sport steering wheel, R -Line "Silver Lane" inlays, R -Line door sill plates, stainless steel pedal caps and tinted rear windows. The package can also be optionally extended to include a black rooflining, black piano finish i nlays and sport seat system in "Nappa leather" (two-tone) or "Alcantara/Nappa" with the R logo on the head restraints (Germany: interior package and extension do not include tinted rear windows or piano finish). High-tech SUV. 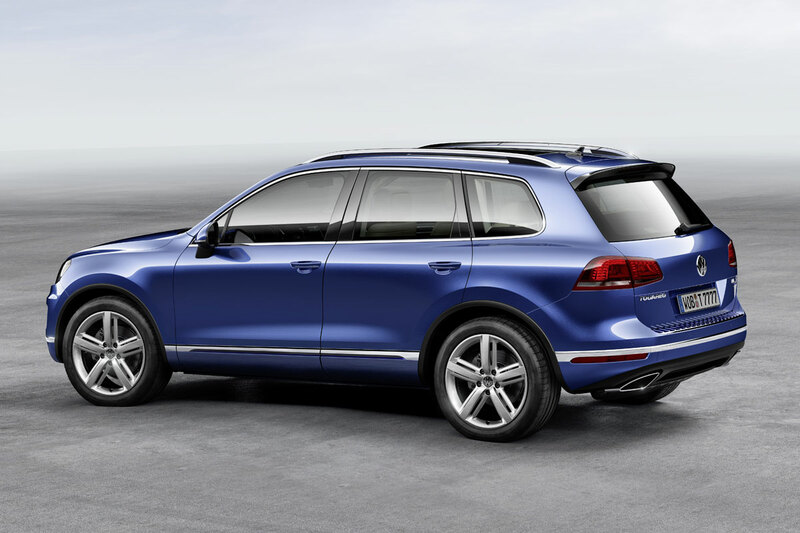 The Touareg offers numerous assistance and convenience systems to the most innovative SUV on the market. Some examples: its parking brake is activated at the push of a button. The motor oil level is electronically displayed in the Touareg. Automatic opening and closing of the boot lid is optional. The largest panoramic sliding sunroof of any SUV brings ample light into the car even on overcast days. The Area View assistance system recognises the surrounding environment of the Touareg via four cameras, which adds to the vehicle's safety. Up to nine airbags offer all-round protection. Lane Assist ensures that the vehicle does not stray from the proper path; and Side Assist warns of vehicles approaching from the rear when changing lanes. ACC adaptive cruise control plus Front Assist with City Emergency Braking brakes to a standstill if necessary. The PreCrash occupant protection system networks the assistance systems and ensures that in case of an accident not only are the belts tensioned, but – if lateral dynamics indicate this is necessary – the windows and the panoramic sunroof are closed. Also innovative are the bi -xenon headlights with optional Dynamic Light Assist. This camera -based main-beam control system "sees" oncoming traffic and vehicles driving ahead and automatically controls the main beam lights, individually for each headlight – via The cornering light module – without producing gla re for others in traffic. 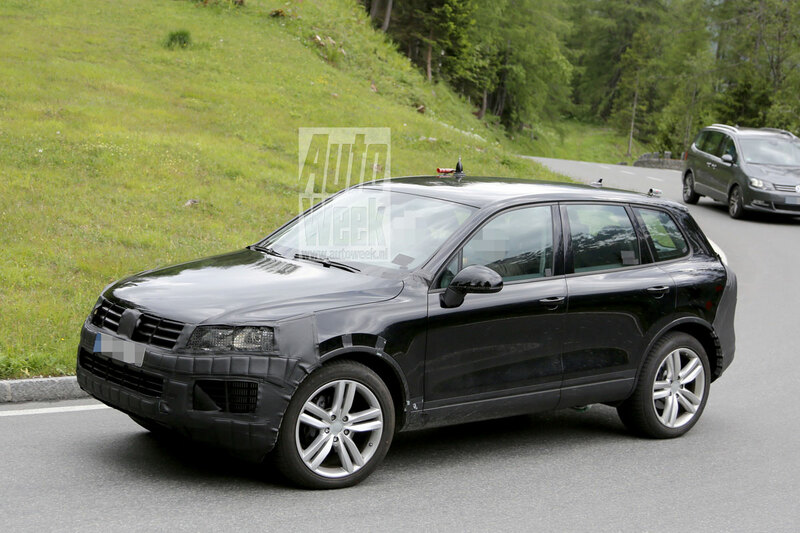 Altogether, the sum of these parts makes the Touareg one of the safest vehicles ever. V6 and V8 engines. The all-wheel drive Touareg is available – depending on the sales region – as a model with a turbodiesel (V6 and V8 TDI), petrol (V6 and V8 FSI), turbocharged petrol (V6 TSI) or Hybrid (V6 TSI & electric motor) drive system. The V6 engines come with an 8-speed automatic gearbox. All engines have a stop - start system as standard; they also ut ilise regenerative braking to recover kinetic energy. 4MOTION. In the base version, all Touareg vehicles have the 4MOTION all-wheel drive system with Torsen differential lock (max. climbing angle: 31 degrees). 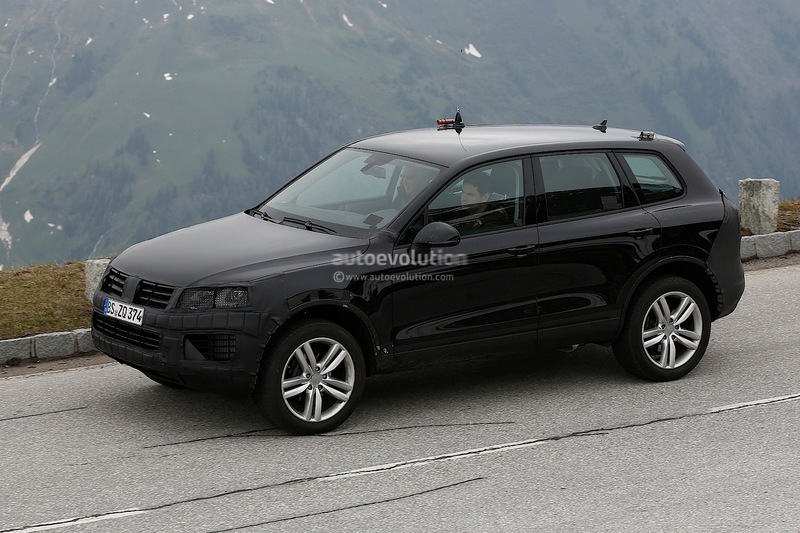 In addition, all Touareg versions have an off-road driving programme that is operated via a two -stage rotary switch. It configures the ABS, EDS and ASR systems for off - road use and activates hill climb assist and gearshift points of the automatic gearbox. As an option, customers can order the Touareg V6 TDI with 190 kW / 258 PS with the Terrain Tech package; in this case, instead of a Torsen differential the vehicle is equipped with a differential that is designed to be even more sturdy for off -road use. It includes a reduction gear stage and central a nd rear differential locks that offer up to 100 per cent locking (4XMOTION: max. climbing angle of 45 degrees). This version has a five -stage turn wheel which the driver uses to configure the SUV for different uses. 190 kW / 258 PS (10 kW more now) and 250 kW / 340 PS. 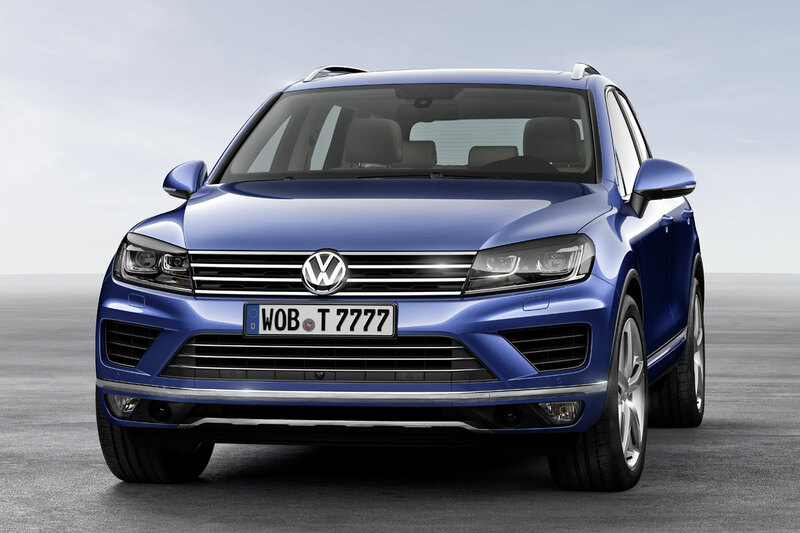 The Touareg Hybrid has a total system power output o f 279 kW / 380 PS. 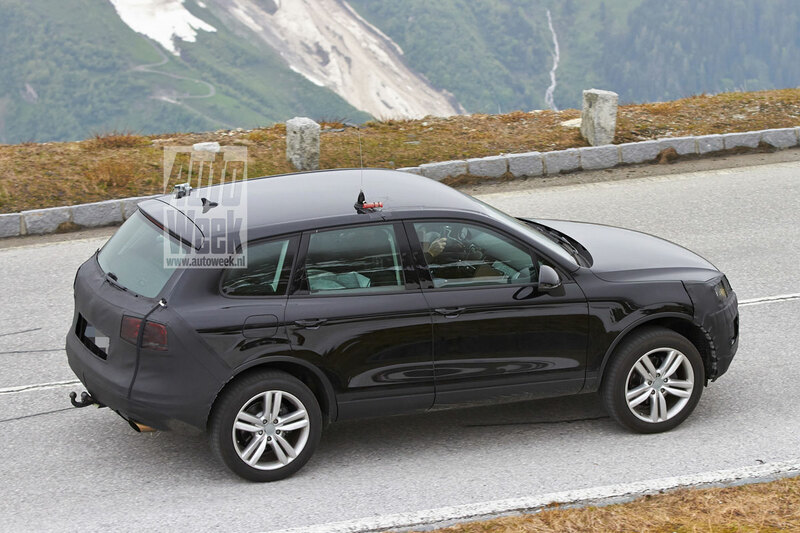 The two V6 TDI engines will now conform to the EU6 emissions standard that takes effect in September 2015. As part of this Conversion, the two engines are now equipped with a new SCR -DPF catalytic converter module, an SCR metering module (AdBlue) and an additional blocking catalytic converter (removes excess ammonia); in addition, the emission control system has an oxidation catalytic converter. At the same time, fuel consumption of the 204 - PS V6 TDI BlueMotion Technology version was redu ced from 7.0 l/100 km (equates to 184 g/km CO 2) to 6.6 l/100 km (174 g/km CO 2). As mentioned, the power was boosted in the 258 -PS version: The "large" V6 TDI now develops 10 kW / 13 PS more power; and yet its fuel consumption was reduced from 7.2 l/100 km (equates to 189 g/km CO2) to 6.8 l/100 (178 g/km CO2). The most powerful diesel continues to be the V8 TDI with 250 kW / 340 PS. European petrol engines – hybrid drive with V6 TSI and electric motor. In Europe, Volkswagen is offering the Touareg Hybrid, which has a 245 kW / 333 PS V6 TSI (turbocharged direct petrol injection engine) together with a 38 kW / 52 PS electric motor. When the two drive sources are working together (boosting), the maximum system power of 279 kW / 380 PS and maximum torque of 580 Newton metres are attained. Despite that, the Touareg Hybrid sets the benchmark among fully-fledged off-road SUVs with a petrol engine with a fuel consumption figure of just 8.2 l/100 km (equates to 193 g/km CO2). It can drive at speed up to 50 km/h in all -electric driving – with zero emissions. 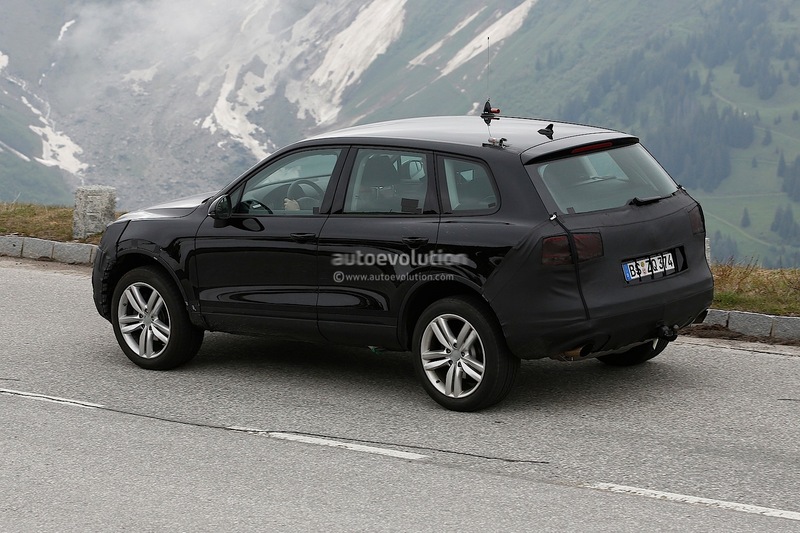 Like all Touareg versions, the Hybrid version is also designed for trailer loads of up to 3.5 metric tonnes. Global petrol and diesel engines – V6 and V8 engines. 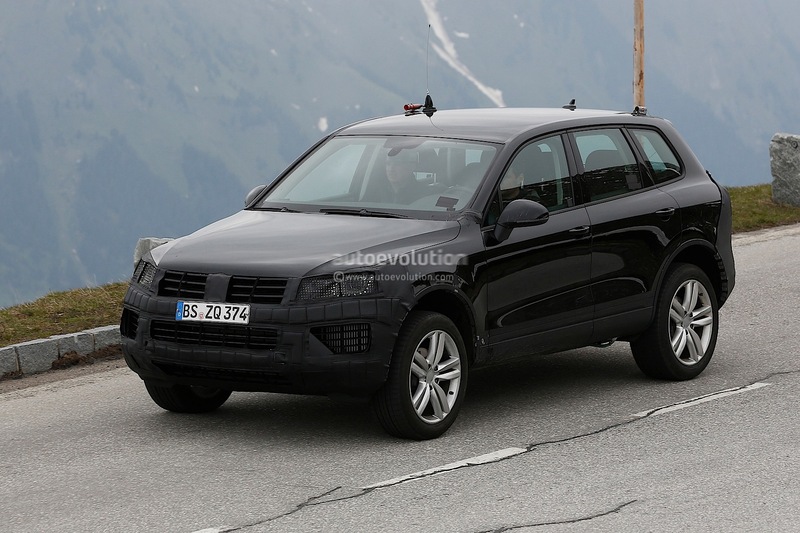 In Asia, the new Touareg is being offered with three petrol and two diesel engines. The petrol engines for China produce 213 kW / 290 PS and 235 kW / 320 PS (both V6 TSI) and 265 kW / 360 PS (V8 TSI). For Russia, Volkswagen offers the new Touareg with two petrol engines; they develop 183 kW / 249 PS (V6 FSI) and – as in China – 265 kW / 360 PS (V8 FSI). 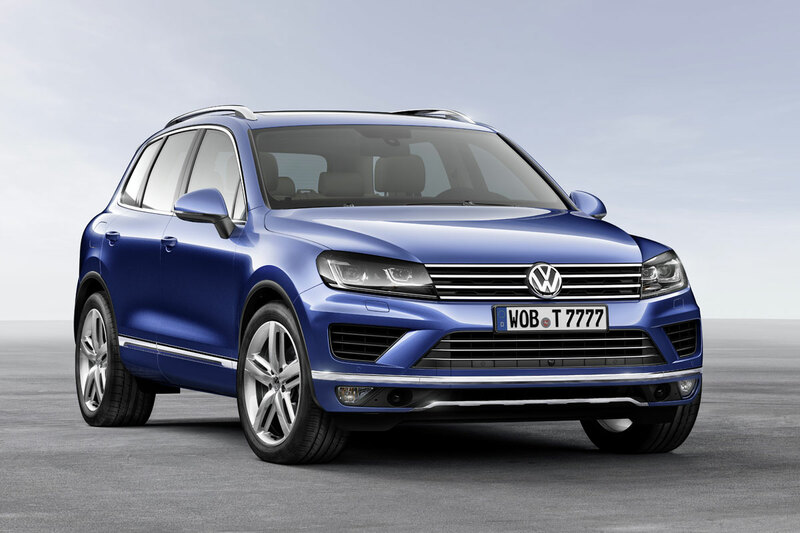 In the USA and Canada, Volkswagen will offer versions of the Touareg with a V6 FSI ( 206 kW / 280 PS), a Hybrid drive system (279 kW / 380 PS) and a V6 TDI (176 kW / 239 PS). Fuel consumption reduced by up to six per cent. Thanks to extensive aerodynamic improvements (such as air inlet openings in front, modified door mirror caps, new wheel spoiler), tyres optimised for low rolling resistance and standard 8 -speed automatic gearbox optimised for low friction, Volkswagen was able to improve the fuel efficiency of the Touareg by up to six per cent (V6 TDI with 150 kW). In everyday driving, fuel consumption is also reduced by an optimised stop-start system (engine is stopped at speeds under 7 km/h now) and by the regenerative braking function. In addition, a standard coasting function for the V6 versions (until now only available with the Touareg Hybrid) optimises fuel economy in everyday driving. How it works: as soon as the driver releases the accelerator pedal, the engine is decoupled from the gearbox; this is also known as "coasting". This is even possible at vehicle speeds up to 130 km/h, so it can be used in motorway driving. Ago 2008 | 17.578 Mens. Como me aburren ya los exteriores de VW..
Feb 2009 | 11.879 Mens. El Cayenne de los pobres. Mar 2004 | 3.959 Mens. Dic 2007 | 2.494 Mens. Ene 2014 | 311 Mens. Mar 2008 | 5.381 Mens. A mi es de los pocos wolwagen que me gustan, lo veo un bicho bastante aprobechable, estos si son para meterlos en el campo. pero no lo mencionan en la presentación... O he leído mal? Or otro lado, creeis que bajarán de precio el actual para limpiar stock? Ahora está en 50000€ la versión Pure....a cuánto puede quedar liquidar stocks? May 2011 | 50 Mens. Que se sabe del Touareg CC? Alguna novedad?